LEESBURG, VA -- Some people say art reflects life. That's probably why art takes many forms -- paintings, sculpture, photographs, etchings, motion pictures -- you name it, and there's a medium for it. If life is diverse, then so is the art reflecting it. Not much room to miss on the par four 13th hole. But then again, it's the back nine's #1 handicap hole. That being said, art has its critics. People may disagree on whether a mangled piece of twisted metal constitutes art, or whether a dialogue-less play really equals a 'script,' but it also seems undisputable that you'll know great work when you see it. That's why you'll agree that Beacon Hill (part of the Golf Club of Virginia) Golf Club is art, with no arguments. Because no two artistic works are ever truly the same, opinions vary on their relative excellence -- maybe that's why there're awards. For movies, there's the Oscar, for music there's the Grammy, and for the stage, there's the Tony. For golf courses (yes, an art form) however, there are only lists such as those found in Golf Digest -- "Top 100 American Courses," etc. No tin statues, no gold plaques, no blue ribbons and no flamboyant fashions either (let's leave Charles Howell III out of this). Perhaps there should be. Because although there aren't any artsy golf awards categories, we've already found a winner. Beacon Hill wins for 'Best Visual Presentation.' Simply put, you'll rarely see anything like it. 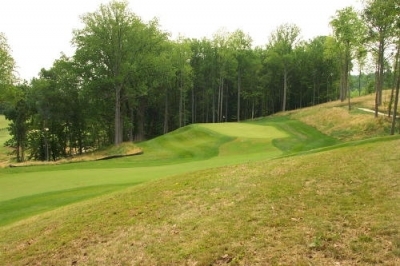 Golf's always been beautiful in different ways, but there's really no matching this club set on the late Arthur Godfrey's former estate near Leesburg in Virginia. It's one of a kind in the Mid-Atlantic -- quite a statement, considering what's already here. You''ll have three fairways to choose from on the par four 12th hole, but here you see the green from across the way. That's not to say it's perfect. 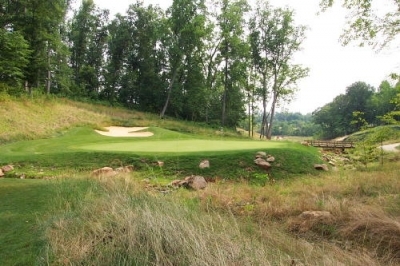 The newly created Golf Club of Virginia, when completed will feature 45 holes designed by Johnny Miller (Beacon Hill's 27) and Jack Nicklaus (Bear National's 18, which will open sometime in 2003, near Dulles Airport), is devilishly challenging. 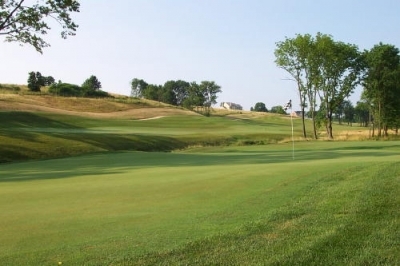 Beacon Hill's setting is so peerless and its ground so undulating and rolling, that you'll be swept away by the surreal scenery and sometimes feel helpless in the golf sense when faced with its daunting and intimidating tests. There are carries on nearly every shot, and the margins for error in many places are razor thin. And where on most courses there are some 'breather' holes, Beacon Hill doesn't really have any. The 497 yard par four 4th carries the front nine's #1 handicap designation, and deserves it. If ever there was a course boasting ten or twelve #1 handicap holes, this is it. It's an incredible test of nerve -- to forget the 'art' and remember swing mechanics. If you're a proponent of stern tests of golf, as well as an admirer of scenic beauty, Beacon Hill's the place. There are holes here that'll remind you of other notorious golf links, such as those found at Royal New Kent, The Cascades at the Homestead and any number of distinctly visual golf experiences. Not bad for a course that's less than a year old. 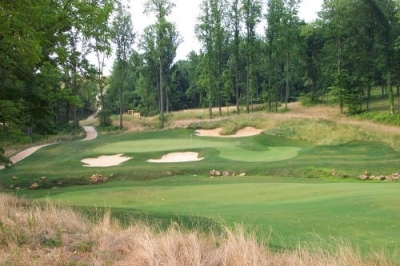 Mike Homer, the Golf Club of Virginia's Director of Golf Operations & Instruction, says it's these qualities that sets his club apart: "Our elevation changes and undulating ground really distinguishes us from most other courses. A lot of people have left here saying they felt like they were playing at Oakmont or in upstate Pennsylvania because of the rolling ground." The downhill par three ninth hole's got a very tricky, front to back slope. Choose the right club here, or you'll roll off the back. Homer continues, "Despite that, even with all the elevation changes, there're virtually no uphill shots. Johnny Miller's group did an incredible job designing the course -- there are maybe two par threes where you'll take half a club more, but there aren't any significant elevation changes on other holes that would require the same thing. They're either downhill, or the tees are level with the greens." Fred Bliss, Director of Golf Course Design Services for Johnny Miller Design, echoed Homer's comments. "Beacon Hill's site was just breathtaking, with some fantastic natural features, dramatic elevation changes and outstanding trees. I grew up in the Midwest, and we just don't have that type of topography there -- needless to say, there was a lot to work with." No bunkers guard the approach to the par five 5th hole, but it's a narrow journey to get to this point. Bliss said because the ground was so uneven, it was too steep in places and required some dirt to be moved. It was also difficult to work the land's natural gifts into the design, but that's what they strove to do: "From a design and construction standpoint, we try to make the golf course fit the terrain. A lot of adjustment is done onsite to fit the various tees, bunkers, fairways and greens into the natural topography. The idea is to make it look like it belongs there and not modify the topography to fit in the golf course." Playability is also a goal: "When we design a golf course, we try to make it interesting and playable for all levels of golfers. That's usually not a problem from the back tees -- but the trick is to make it challenging for the better golfer, yet playable for the average golfer. You achieve that by building a wide assortment of tees, and by placing hazards so they'll come into play for the better player and try to keep them out of the way of the higher handicappers," Bliss said. The philosophy extends to the greens, too. "You want to have enough pin placements on the greens where you can put a pin behind a bunker, or next to a lake edge or a hazard at certain times. But the majority of times, the pins are readily accessible to most golfers, including the less skilled players. We think all of those elements were successfully incorporated into the Beacon Hill design -- it's a fantastic site and a beautiful golf course," Bliss added. Trees, rolling hills, environmental areas and bridges. Beacon Hill at its best. Bliss acknowledged that Beacon Hill will play difficult, especially from the back tees: "Often times, when preserving and utilizing the natural features, it increases the difficulty of the golf course because of the water, the terrain, the natural vegetation, the native grasses, that sort of thing. 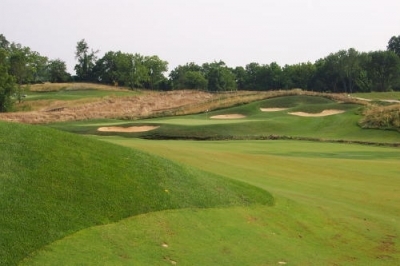 We strive to utilize those features and work them into the design of the course and into the strategy of the course, but certainly from the forward sets of tees to make it as reasonable and playable as possible. From the back tees, we're pretty much going to give the golfer all he wants." It's abundantly clear that Bliss and Johnny Miller accomplished their goals -- the better player will have all he wants at Beacon Hill, and Homer acknowledges it, too. "This is really a 'thinking' type of golf course. Certainly, when you first come here, you'll probably be overwhelmed by the carries and the visually intimidating nature of the layout. But once you've played the course a few times, you'll learn where to place the ball, and you'll be shooting at or near your normal handicap." The 8th is a short par four that plays downhill; but the undulating green will mandate a precise approach shot to surrender a birdie or par. "Because there are lots of carries out there, it's very much of a placement golf course. And because many of the greens are designed in a more traditional style (where the slope is front to back instead of back to front), you're going to have to know the best parts of the greens to shoot at in order to leave make-able putts. This is a course where experience is essential," Homer said. 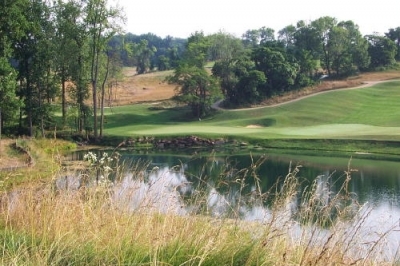 One of the benefits of membership � you'll get to play the course enough times to make it familiar. The Beacon Hill site's 'Best Visual Presentation' designation makes it worthwhile to challenge it over and over again. And although there are large homes surrounding the links, they're more than a driver's shot away. Homer explains: "Technically, you could say we're in a residential development, but this is one golf course where the homes truly don't impact play. The entire Beacon Hill property consists of 1100 acres, and there are only 220 home sites on it. For the golf course, we took 350 acres." The 10th green. A truly beautiful spot. "It's something people don't realize, because they think the development hasn't built out yet. But pretty much all the lots have been sold, and they are large. The fact is, the houses will never be close enough to hit. And we've also only got one set of parallel fairways. When you combine the setbacks of the homes from play, along with 15 minute tee times, and the fact you probably won't see many other players even on our busiest days, there's a lot of space out there to soak in the scenery," Homer says. And the club itself will also continue to grow, when the clubhouse is built. Homer says they hope to have the first clubhouse open next year, and that's probably when Johnny Miller will visit to officially open the facility (in addition, they'll have a second clubhouse and some 'cottages' to stay onsite for overnight guests). Shadows cross the green on the par five 2nd hole. All the talk of its location doesn't detract from the golf course. Simply put, you'll encounter some of the most stunning golf holes you'll ever see. One in particular, the current # 12 (there are 21 holes open, and sometimes the sequence is redone to incorporate different holes), has a split fairway. Sure you've seen holes like that before, but split three ways? Bliss explains: "That's an interesting hole, where we had some constraints to overcome. I think two fairways would've been better, but because of the terrain and the slope on that particular fairway, in order to level it out and get some width, it turned out that making three steps worked better than two -- as far as balancing the cut and fill and raising the height of the exposed cut faces and those kinds of things. But being a relatively short hole, a short par four, we thought a three-way split might be something that's a little unusual, but would work." At Beacon Hill, the unusual does tend to work. 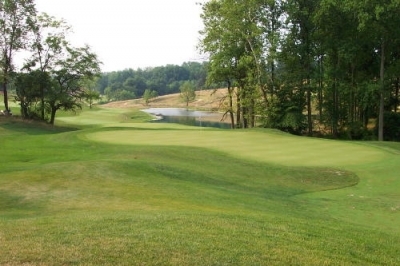 Whereas the course seems to have several difficult holes in succession on several parts of the layout, Homer says that will ease up some, too, when all 27 holes are open: "People have to remember, this is not the way the three nines are going to play. The course will have returning nines, and the sequences will flow a lot more naturally. It won't necessarily make it easier, but you'll see that it makes more sense." Making sense is a good thing, but with Beacon Hill's plethora of natural gifts, it'd be hard not to achieve understanding of the place. Homer puts it best: "We received a compliment from a member of Congressional Golf Club that sums it up. He was on our 14th hole, and he said, 'Mike, I keep trying to determine what the signature hole is. I think I just played 14 of 'em.'" Sounds like the voting for Beacon Hill's "Best Visual Presentation" award will be unanimous. 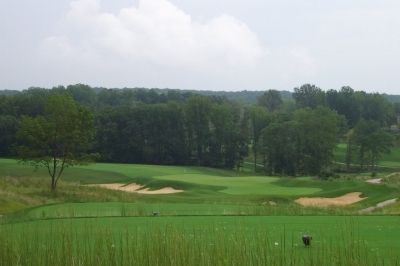 Note: Check links below for links to other private clubs in Northern Virginia. Fred Bliss credits Tom Clark of Ault, Clark & Associates with laying out the initial routing of the holes. Membership Information: Memberships are available. Contact Mei-Mei Venners. (703) 669-4600. Beacon Hill does offer limited public play at this time as a 'sneak preview' for potential members. Call the above number for information, and consult the website for further information on future amenities.